As an epitome of China's manufacturing development, Foshan offers a sample of implementing "Made in China 2025" and some practical experience in pursuing manufacturing transformation and upgrading. This is a conclusion of the "White Paper: Made in China 2025 Foshan Sample" released at the 2018 Made in China Forum, a one-and-a-half-day event that opened in Foshan, Guangdong Province on Jan. 13. Composed of nine chapters, the white paper examines Foshan's efforts and experience in implementing the "Made in China 2025" target and pursuing manufacturing transformation and upgrading. In May, 2015, the Chinese government unveiled the 10-year national action plan designed to transform China from a manufacturing giant into a world manufacturing power. To achieve its implementation, 30 provincial governments formulated action plans designed to fit for their own conditions, and the Ministry of Information and Technology selected 21 cities or city clusters including Foshan as pilot areas. After more than two years, the time has come to reflect on both the achievements so far and problems that have been revealed. 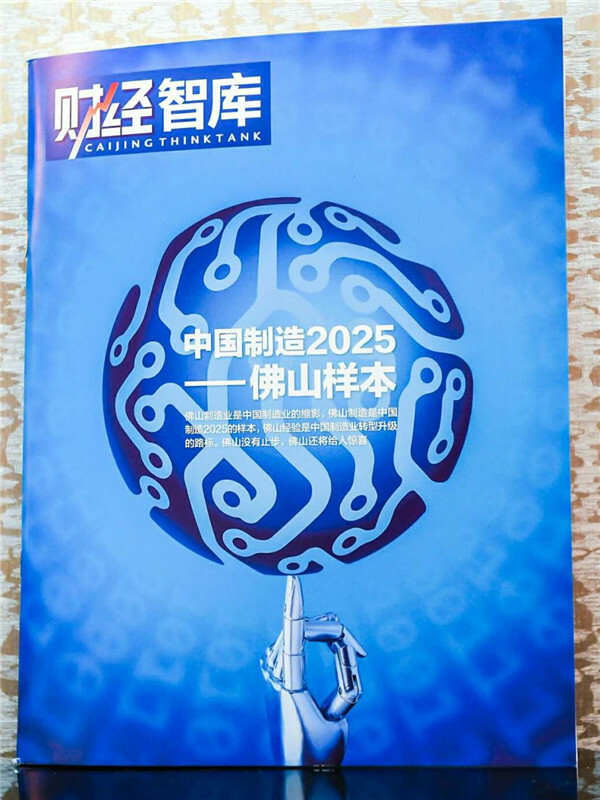 In this context, CAIJING Magazine, a weekly business magazine based in Beijing, and its affiliated CAIJING Think Tank organized about 20 Chinese economists to study Foshan's efforts to implement the "Made in China 2025" program in its economic activities. "The research team conducted field surveys in Foshan on four occasions and held two seminars in 2017," said Zhu Sendi, honorary director of the China Machinery Industry Federation in introducing the white paper at the forum. Foshan was chosen because "its trajectory of manufacturing development is similar to that of the whole country, namely from carrying out industrial transfer to pursuing industrial upgrading," Zhu explained. In addition, though neither a provincial capital nor a special economic zone, Foshan has achieved greater success in industrialization than other comparable Chinese cities, according to the research team. Foshan's GDP was 863 billion yuan in 2016, next only to Guangzhou and Shenzhen within the province, and its 2017 GDP is expected to reach 950 billion yuan. Foshan's total industrial output value in 2016 ranked second among sub-provincial cities, and its Purchasing Managers' Index (PMI) has been above 50.0 for 15 consecutive months from Oct., 2016. Faced with diminishing comparative advantage in the cost of production factors, Foshan has been focusing on supply-side structural reform by improving the efficiency and quality of development as well as fostering new growth drivers. Foshan's success in manufacturing development can be attributed to the synergy between government, market and society, said Zhang Yansheng, researcher of the Macroeconomic Research, National Development and Reform Commission and a member of the research team. Foshan has coordinated the role of "the visible hand" and "the invisible hand," under which government seeks to create a sound business environment while allowing the market to play a decisive role in resource allocation. Well on its way to developing into a national manufacturing center, Foshan is expected to make even greater strides from now on, as described in the white paper. With a theme of "New Industrial Revolution in a Changing Global Manufacturing Landscape", the 2018 Made in China Forum gathered political, business and academic leaders from China and abroad to discuss global manufacturing trends, China's new role in the global industrial chain and other key issues.